We had a pretty sleepy night last night. The nurse ended up just gavaging Emmett at every feed except one, during which he nursed vigorously for about five minutes and then was out cold. He took in 12 ml, which isn’t a lot, but I thought was pretty good for just five minutes. This morning, Dr. L came to visit and announced we have a new plan. Even though he’s nowhere close to the 80 percent feed volume we were aiming for in order to remove the NG tube, he decided to remove it now anyway and do a 48-hour trial of feeding on-demand. He thought maybe the strict three hours between feeds wasn’t giving him a chance to get hungry (for the record, I’ve been saying this all along!! ), and the fact that he takes in near-full volumes some feeds and practically nothing others means he’s capable of taking a full feed but just might not be hungry sometimes. So the new plan is to nurse or bottle-feed whenever he actually acts hungry, regardless of how long it’s been since the last feed, but not to go any longer than four hours. This is basically what you’d do with a normal newborn anyway, and most newborns figure out how to eat what they need to grow, so we’re hoping he does the same. 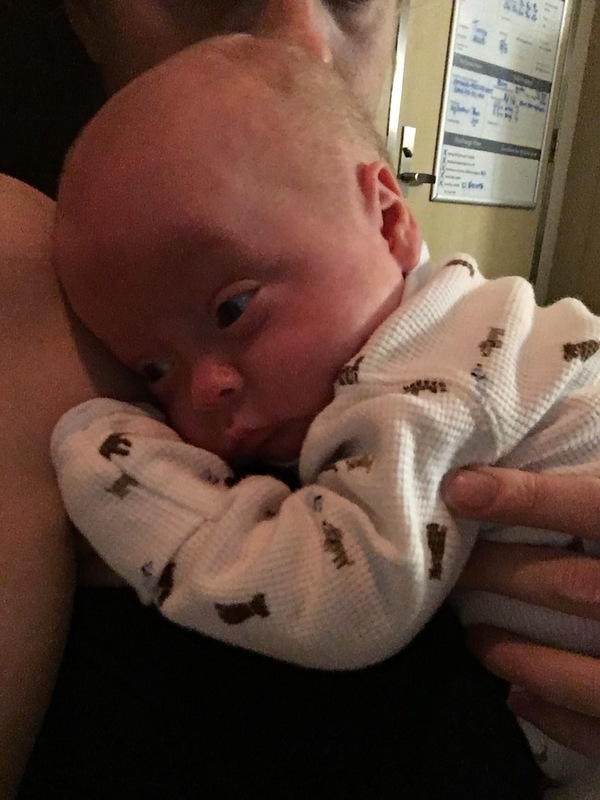 If after 48 hours he’s losing weight or not wetting enough diapers, they’ll put the feeding tube back, and we go back to our original plan of aiming for 80 percent orally and gavaging the rest. We’ve had three of the on-demand feeds today and the jury’s still out on whether the new plan is working. So far he’s definitely eating more at each feeding, but he’s also going pretty close to the maximum four hours in between feeds — which means instead of eating 65 ml every three hours, he needs to be eating 85 ml every four hours in order to take in the same daily volume. So percentage-wise, we’re pretty much even with where we were before. At least so far. I feel like three feeds is too soon to tell and that once he realizes he dictates when he eats his patterns may change. I must say, it feels nice to have a new plan since we weren’t making much progress the old way. At least it feels like we’re doing something. And if it doesn’t work, it was nice to have a naked-faced baby for a while. Awwww….go Emmett! This is good news that they are willing to try something different. He looks great! I can’t believe this guy was just over 1 lb a few short months ago.